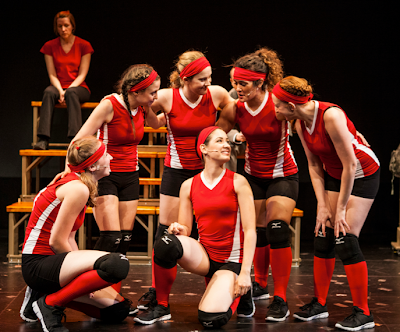 I got on the ball to catch VOLLEYGIRLS at the New York Musical Theatre Festival on Saturday. I felt like I was at the gym with all of the fans cheering on the team in their championship. It was such fun and now I want to get out there and join a volleyball team! Fabulous Susan Blackwell plays a disgraced Olympian coaching a team of Catholic high-school volleyball players. The musical features a book by Rob Ackerman with lyrics by Sam Forman and music by Eli Bolin. The sporty choreography is by Ryan Kasprazak. The director is Neil Patrick Stewart. VOLLEYGIRLS performs at the Romulus Linney Courtyard Theatre (The Pershing Square Signature Center, 480 West 42nd Street, NY, NY 10036) during the NYMF. VOLLEYGIRLS might be on the verge of being the typical underdog sports story, but its advantage is that its centered around a group of young women, all experiencing growing pains and searching and achieving purpose. One by one, including their coach, each finds her way through personal and team success. It's heart-warming and tear-inducing, all the while serving up sweet and funny tunes. I fell in love with the story, the look of the show and especially the music. The team and its supporters are played by a fabulous cast: The production stars Susan Blackwell ([title of show]) as Kim Brindell, Chuck Karel (Hello Dolly (OBC)) as Ref, PJ Adzima as Xavier Ives, Juliane Godfrey (Goodspeed’s Good News!) as Katie Kavett, Jennifer C. Johnson as Flo Hartline, Julia Knitel (Bdwy: Bye Bye Birdie) as Ingrid HansonTuntland, Gerianne Pérez as Marisol Rodriguez, Allison Jill Posner as Jocelyn Andrews, Dana Steingold (Bdwy: Godspell) as Stretch Mandelbaum, Allison Strong (Bdwy: Bye Bye Birdie) as Jess Hartline and Benjamin Howes (Bdwy: Scandalous, [title of show]) as Glenn Kavett. VOLLEYGIRLS is playing in the NYMF for five more performances: Tuesday the 23rd at 5 pm, Friday the 26th at 5 and 9 pm and Saturday the 27th at 1:30 and 5 pm. Tickets are available online via Ovationtix. Visit the team's website at www.volleygirlsthemusical.com.